It'll be summer in Bend, so wer're crossing our fingers for a sunny warm day the day of the event. For attire think summery wedding, so maybe dresses and khaki pants, but also whatever makes you most comfortable. It's a wedding in our yard, so no suits and ties needed and if you want to wear heels maybe go with wedges unless you want to aerate the yard! 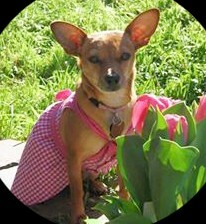 *You may use Mia in a sundress as inspiration!